HAP 100 là Headphone Amplifier Single End Class A.
HAP 100 cũng là Pre Amplifier sử dụng cùng với công nghệ của P20 , một sản phẩm hàng đầu của nuforce dành cho audiophile. Điểm mạnh và nổi bật về HAP 100 ngoài phần thiết kế nhìn rất đẹp, thì phần quan trọng nhất đó chính là âm thanh, HAP 100 mang đến 1 âm thanh trong trẻo, tốc độ, tái tạo chính xác, cùng với độ phân giải cao và rất nhạc tính. Như CEO của Nuforce nói, nếu xét về công nghệ, chất lượng âm thanh khi so sánh với các nhãn hiệu khác cùng chức năng,công nghệ, khả năng, kỹ thuật..., thì giá trị của HAP phải cao hơn thế nhiều. HAP 100 có 4 đầu vào RCA low-noise, sạch và 1 đầu ra out put RCA, mặt trước có 1 rắc cắm out put cho headphone 6,3". Có 2 màu Silver hoặc Black. 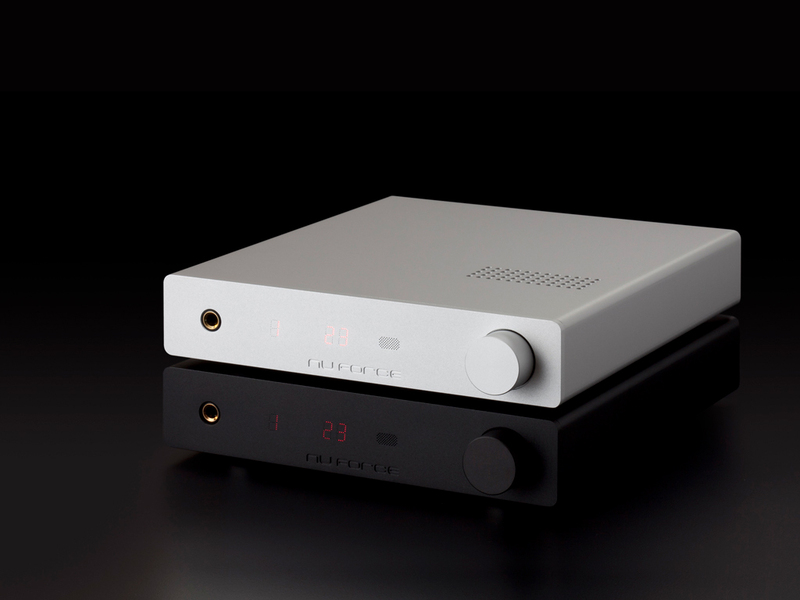 The HAP-100 is a preamp and headphone amplifier for the audio enthusiast for whom quality headphone listening is a priority. The HAP-100's innovative design offers features never before available at its modest price point. 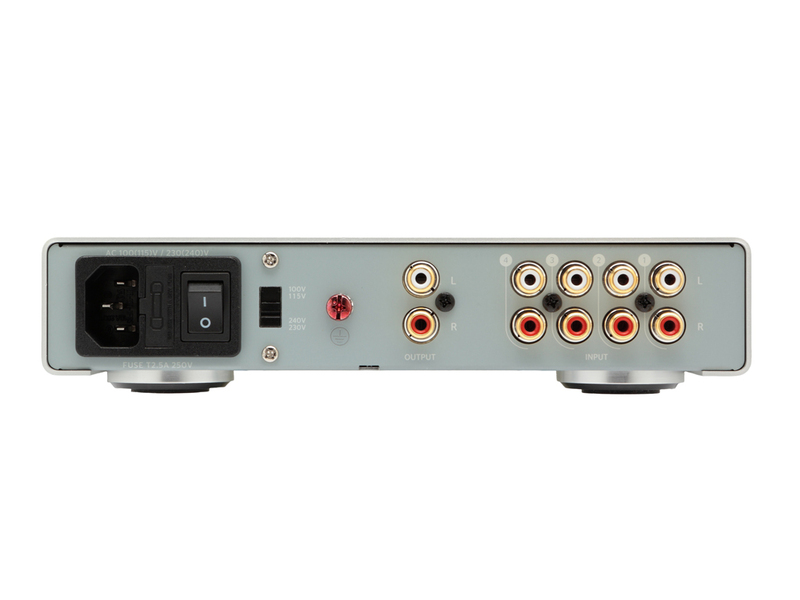 Most significantly, the HAP-100 shares technologies first employed in our flagship P-20 preamp, along with other audiophile-grade developments. 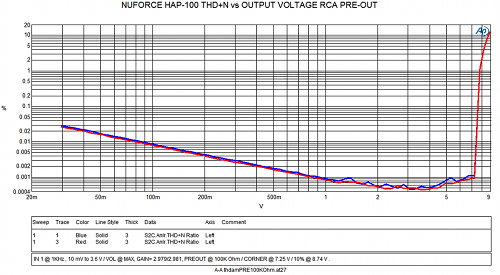 As with the remarkable P-20, the HAP-100 exploits NuForce's most recent work in volume controls. At the unit's core is a switched-resistor ladder network of low-noise, thin-film resistors, one per volume setting, permitting discrete, high-resolution increments of 1dB for the HAP-100's one hundred volume steps. We have every confidence that the most demanding listener will find the HAP-100 to be the ideal centerpiece for headphone and conventional stereo listening. For transparency, speed, accuracy, resolution and musicality, along with high style and convenience, the HAP-100 has no equal at its price. 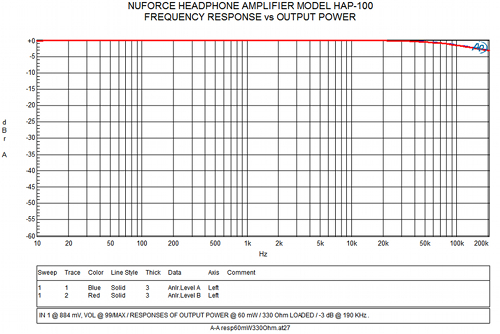 Indeed, our confidence is such that we invite the listener to compare the HAP-100 with higher-priced equivalents. 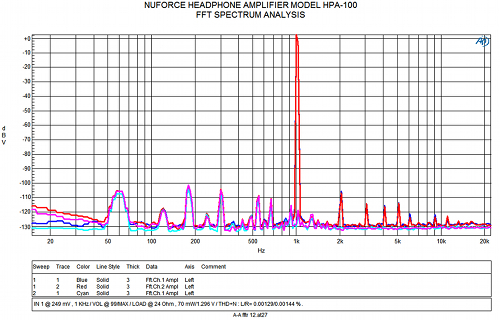 This plot shows the Frequency Response of the HAP-100. As one can easily see, the response is ruler flat from 10 Hz out to at least 40kHz. Even more significant, the output is down only -3dB at 200 kHz. This indicates that the phase response of music signals will not be negatively impacted in the least, to well beyond the audible range. In other words, all musical waveforms will be faithfully reproduced such that there will be no alteration of timbre or dynamics, from that of the original signal. 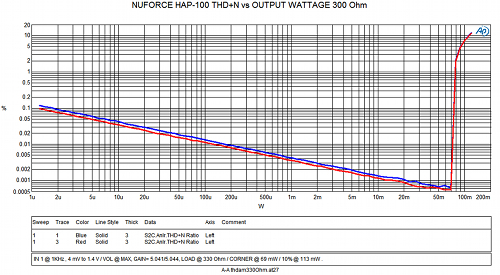 Here we see the THD+N performance of the HAP-100's preamp output. While performance is essentially "textbook perfect" in the region above 1.0Vrms output, even more important to note is the "monotonic" nature (linear slope) of the response below that point. Since the measurement is based on a percentage of total output voltage, the increasing level below 1.0Vrms is nothing more than an artifact resulting from the "rule of percentages." As the output signal decreases, the remaining background noise (however little it may be) will always become a larger and larger percentage of the total response. Therefore, the measurement below 1.0Vrms can be somewhat misleading. The fact that the slope is very straight and linear though, does tell us that there aren't any non-linear distortion artifacts contributing to the total output. If there were, one would see plateaus and/or rises in the slope as the output signal level decreases. Since that is not the case here, the plot indicates exceptional low-level signal performance. The audible result will be a very accurate presentation of musical timbre and a lack of any added coloration, even at the lowest listening levels. This plot reveals the spectral makeup of both the residual background noise and any Harmonic Distortion artifacts. As one can clearly see, all undesirable components manifest themselves below -100 dB, with most below -110 dB. Such performance all but guarantees that there will be no audible contribution from such negative artifacts when listening to music or speech. In fact, this performance actually exceeds the dynamic range capability of traditional Red Book Compact Disc recordings (16-bit = 96 dB total dynamic range). In addition, the noise components exhibited below the 1kHz stimulus signal are simply a result of 60Hz AC power line contamination, which is practicably unavoidable unless a given device is operated by DC battery power. Even then, the indicated performance is exemplary in that few AC powered devices ever offer such low levels of induced hum & noise. We should also make note of the Harmonic Distortion artifacts exhibited above the 1kHz test signal peak. The first harmonic at 2kHz is below -105 dB, with the rest up to 5kHz at or below -115dB. Then any Higher Order Modes (HOMs) from 6kHz on up are below -120dB... or simply non-existent. Factored together, this represents unprecedented performance for any product, let alone one of the HAP-100's price class. Not only are such artifacts inaudible, but also, such low levels are seldom ever observed in even the most exotic/expensive audio gear. 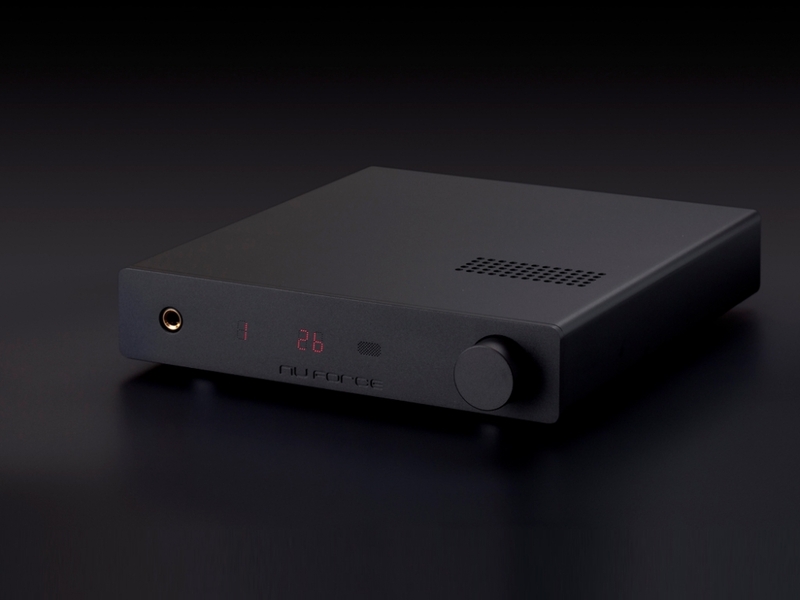 Finally, we come to the HAP-100's headphone amplifier THD+N performance plot, which covers a span of 1-microwatt to 70-milliwatts output power into 300-Ohms (common impedance exhibited by many quality headphones). You will note that it is very similar to the preamp output THD+N plot with regards to its linear "monotonic" slope. As a result, the same conclusion can be drawn from the data: The audible performance will be one of a highly accurate presentation of musical timbre and a lack of any added coloration at all listening levels. 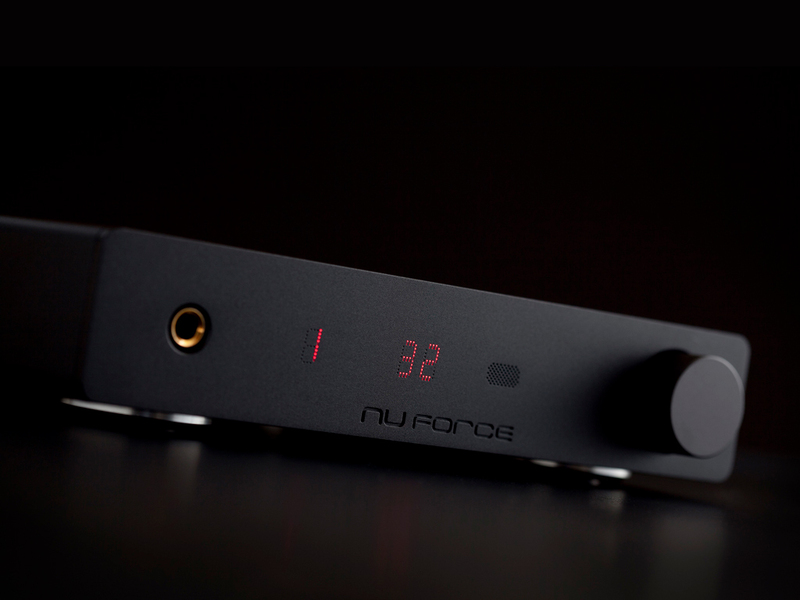 Considering that between 20mW & 70mW (most commonly used power range) THD+N is less than 0.001%, this performance represents a benchmark level for any high quality headphone amplifier, regardless of price. 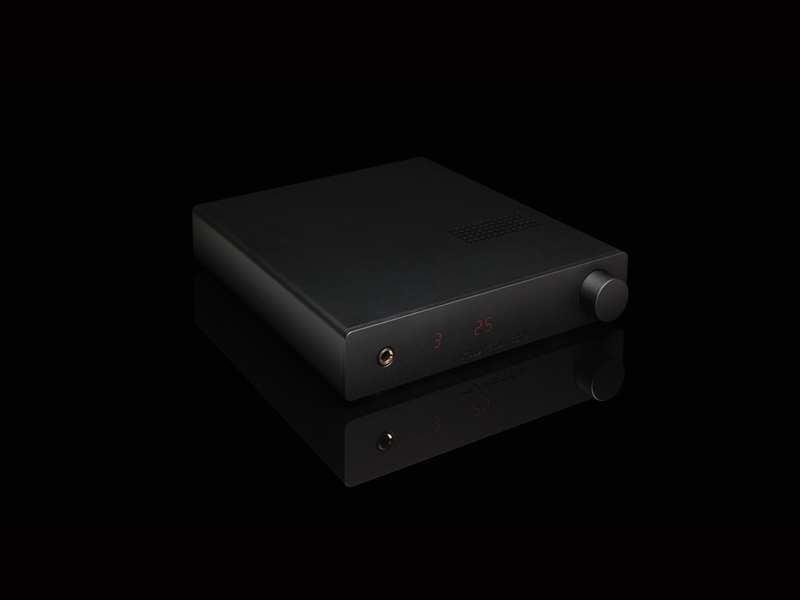 0 Đánh giá cho "NuForce Headphone Amp, PreAmp HAP 100 - Black"